Figure 1. 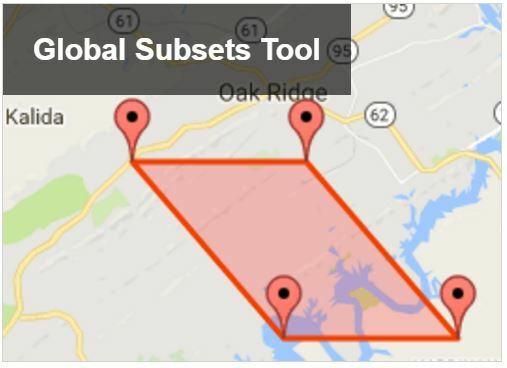 Users may request a subset for any land location on earth. The subsets are provided in GeoTiff and CSV file format. The tool also provides interactive data visualizations. Please refer to Section 5 of this document and to the MODIS/VIIRS Citation Policy page for more information on how to cite your MODIS and VIIRS product subsets. The data products available through the MODIS/VIIRS Global Subsetting Tool are generated by instruments on three satellite platforms: the MODIS instruments flown on NASA's Terra and Aqua satellites, and the VIIRS instrument flown on Suomi NPP. MODIS products from Terra are available from February 2000 to present and Aqua products are available from June 2002 to present. VIIRS products are available from January 2012 onward. They are available for daily, 4-day, 8-day, 16-day, and annual composite periods at 250-m, 500-m, or 1-km resolution, depending on the product. Data in spatial file formats are available in sinusoidal and geographic (WGS84) projections. Please refer to the ORNL DAAC's MODIS/VIIRS Documentation page for a list of available data products. The MODIS/VIIRS Global Subsetting and Visualization Tool streamlines the use of MODIS and VIIRS land product data for characterization of field sites, rapid time-series visualization, validation of models and other remote sensing products, and other research activities. MODIS and VIIRS tiles are provided to the ORNL DAAC by the Land Processes DAAC (LP DAAC). The ORNL DAAC creates subsets and packages the data. The MODIS/VIIRS Global Subsetting and Visualization Tool is accessed via the link on the MODIS/VIIRS Get Data page. Users are required to log in with their NASA Earthdata login information before placing an order. The four steps for ordering a custom subset are described below. Clicking Back returns the user to the previous step. Step 1. Select the location of the center point for the subset order by either clicking the map or providing latitude and longitude coordinates in decimal degrees. Click Continue. Step 2. Select a Land Product; enter desired subset size by providing the number of kilometers Above and Below and to the Left and Right of the center point specified in Step 1. Click Continue. Step 3. Select the temporal starting and ending dates; choose to output GeoTIFF subsets in native sinusoidal projection, or to reproject to geographic lat/long (WGS 84); provide an email address. Click Review Order. Step 4. Review order details and click Create Subset. An order summary with order status is displayed. The subset order is placed when the user clicks the "Create Subset" button. The user will be notified via email when the subset is ready for download and viewing. A unique URL containing the order content is provided via email. The email also provides citations to the data products and the subsetting tool. The order viewing page contains order details, visualizations and legend, subset and QC details, citations, and download links available in the tabs at the top of the page. IGBP land cover classification, vegetation phenology, and various R plots are accessible for subset data near the bottom of the visualization page. Please note that subset orders are deleted after 30 days. A record of past orders is kept for each user at the User Order History page. Orders are listed chronologically and sortable by processing status, product, latitude, or longitude. Classroom exercises are maintained on the MODIS/VIIRS Land Products Subsets page. The exercises have been provided by instructors from various institutions to help students and researchers understand the basic concepts of remote sensing as well as the use of the subsetting and visualization tools provided by the ORNL DAAC.